The story may have its fair share of schmaltz and cheesiness, but the direction and performances from the cast make this a believable and painful story about young love. It’s also refreshing to see a film that doesn’t overstay its welcome. Nice review. 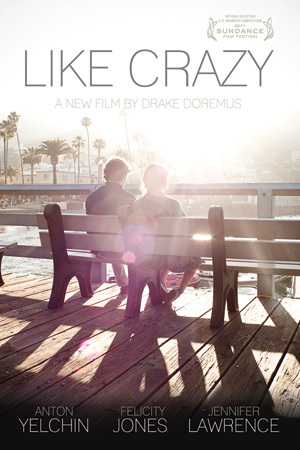 Like Crazy just started playing in my city yesterday, so I haven't yet had a chance to see it, but I'm really looking forward to it--even after reading this. Funnily enough, your (bitter) review makes me want to see the movie even more. I prefer films that are realistic and gritty to ones that sugar-coat and over-romanticize relationships and life. I think this may be right up my alley. DAN - I agree, the performances are fantastic. TB - My review is bitter? What's bitter about it? I too, love films that are gritty and real, that wasn't my problem with this film -- my problem was that they were essentially uninteresting people with no problems getting all bothered about not much of anything at all! Your last sentence led to that "bitter" conclusion, but it feels like you're belittling love in general in the review. Saying that young romances aren't a big deal, and that they should just get over themselves is insulting to those who are going through it. I met my husband at 17. We were long-distance for 9 months before finally living in the same city, and each day of those nine months felt like a year. It sounds like you were annoyed at watching people being tortured by love. Like, you think it shouldn't be such a huge deal if they can't be together, but for people in that situation, nothing is worse. Considering I've yet to see the film, though, I concede that the characters could just be super-annoying. I'm really only commenting on the review at this point. I'll let you know if my opinion changes after I've seen it.